that when established organisations put their existing experience and capabilities to work, they can outperform the best startups. We at altershape believe established organisations have a wealth of people and capabilities to tap into when shaping their future. Our three step approach of lean strategy execution combines proven analysis and architecture methods with lean startup and innovation techniques in a pragmatic way, adapted to your organisation. This way, we help you leverage your best resources so you can discover the best ideas and make them happen. Read our blog for hands-on info on our approach. You can also attend a public event to learn more. Ideas are cheap and plentiful, but execution often falls short and few ideas lead to valuable results within reasonable time and budget. The innovation canvas supports you in the first stages of innovation. Get started: get the free Innovation Canvas download below. You can also attend a public event or organise an in-house workshop. 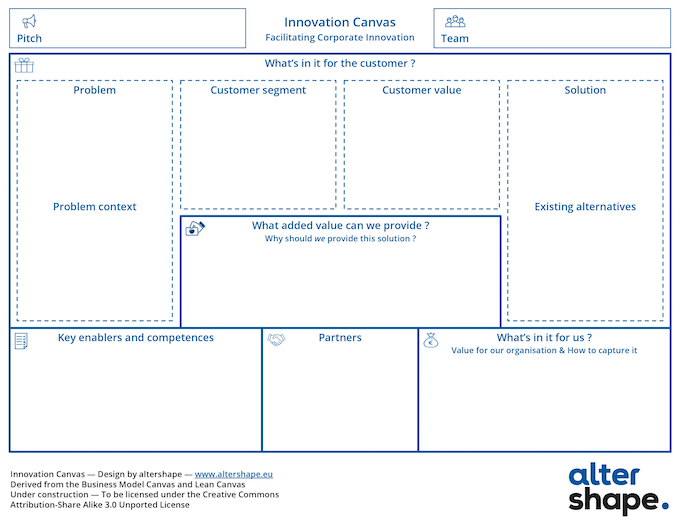 Get started with the Innovation Canvas yourself: download our free tips and tricks and a printable canvas. Please tick to receive the Innovation Canvas and future email updates. We ask for your email address so we can provide you with further tips and insights, and to get feedback on how you use the Innovation Canvas. You can unsubscribe at any time by clicking the link in the footer of our emails. Thank you so much, Penny, for your passion and commitment in doing the work and creating the summits; and to Filip for developing such a thought-provoking, forward-looking and intelligent approach. It seems to blend realism, presence, innovation and common sense into a fresh and viable road forwards. Brilliant last conference session 'Perfect your Pitch through Ritual Dissent'. Loads of energy and useful discussion in our group and learnt a new technique. Filip thought along strongly with the specific cases of our business. Plenty of practical work and examples to keep everyone’s interest. Good interaction with attendees. This talk was well constructed and had some great key points. The examples were salient and easy to embrace. Mr. Hendrickx shared a very simple, compelling process with templates that I will be able to take back and share with my team. Lean strategy execution: the BA's cup of tea? Think - Shape - Try your idea: hoe innovatie faciliteren in jouw organisatie? BA: The missing link between strategy and execution ? Lean strategy execution: the BA's cup of tea ? Get in touch for an in-house workshop, fine tuned to your needs.